The heated steering wheel can be used to heat the leather portion of the steering wheel. The indicator light comes on when the heater is operating. The heated steering wheel will automatically turn off after about 30 minutes. Press the switch to turn the heated steering wheel off and then press the switch again. If the indicator light still flashes, a malfunction may be occurring. 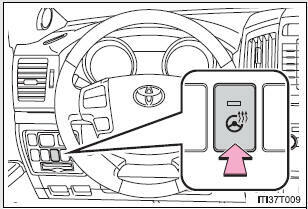 Turn the heated steering wheel off and have the vehicle inspected by your Toyota dealer. Do not use the heated steering wheel more than necessary. Doing so may cause minor burns or overheating. Turn the switch off when the engine is not running.